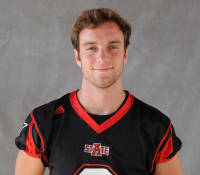 Arkansas State sophomore kicker Brian Davis set a new ASU and Sun Belt Conference record with six field goals as the Red Wolves defeated the Central Arkansas Bears 53-24 Saturday night at ASU Stadium. He connected from 24, 32, 33, 34, 21 and 33 yards, and converted all five of his extra points to set an ASU and SBC scoring record by a kicker with 23 points on the night. His performance moved the Brentwood, Tennessee native into the top five in the nation in field goals made. Senior Danny Hrapmann’s dozen points were crucial to the University of Southern Mississippi’s 30-24 road victory over the University of Virginia on Saturday afternoon. He split the uprights from 43, 31 and 27 yards and added three extra-point conversions to move into third place all-time among Golden Eagle kickers with 196 career points. He put a little icing on the cake with a 31-yard rush on a fake punt. The New Orleans native was one of the three finalists for the 2010 Lou Groza Award and was the kicker on the Walter Camp Foundation All-America Team. Just four games into his sophomore season, Syracuse University kicker Ross Krautman moved into ninth-place on the Orange all-time field goal list thanks to his second career 4-for-4 performance. His 27-yard field goal in overtime was the game-winner in the 33-30 victory over the University of Toledo on Saturday. It was, however, a kick that Krautman didn’t make that proved newsworthy, as the Big East Conference announced after the game that the extra point to tie the game 30-30 should have been ruled a miss. The Franklin Lakes, New Jersey native converted from 33, 31 and 29 yards in regulation.